Many men prefer to shave in the shower rather than stand at the bathroom sink. Not only is shaving in the shower convenient, it actually reduces the mess and the time it takes to clean up after your morning grooming routine. 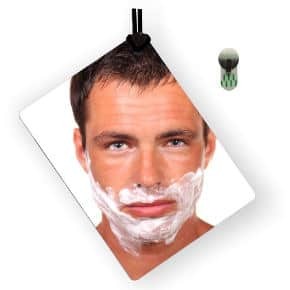 However, in order to shave in the shower you need to have a mirror that can withstand the heat without steaming or fogging up and that is large enough to allow you to see your entire face so you can get that close shave you want. So, here is a look at the 6 best shaving mirrors available on the market today. This Fogless Shower Mirror with Squeegee measures 8.5” X 2.6” X 9.” Keeping it from fogging is as simple as filling the back of the mirror with hot water. The mirror itself is not glass but shatterproof acrylic and comes with a built in shelf for storing your razor, the squeegee or other shower essentials you want to keep handy. It also comes with a squeegee for cleaning the mirror and removing excess water. It mounts to the shower wall using double sided silicon adhesive tape. While most users like this mirror and state that it really is fogless, few say that sides of this mirror cause some distortion so the actual viewing area of the mirror is smaller than it should be. However, the vast majority of people really like this mirror and report that it is suitable for meeting their needs. This Upper West Collection Shower mirror with rotating suction is a round mirror that is about 6.5” diameter. It hooks to the wall with a special locking suction system, however, it does not stick to textured walls. It only sticks to marble, ceramic, acrylic, porcelain and fiberglass shower walls. The mirror is easy to rotate as it easily moves side to side as well as up and down. Users give this product very good ratings and state that it is extremely easy to install. 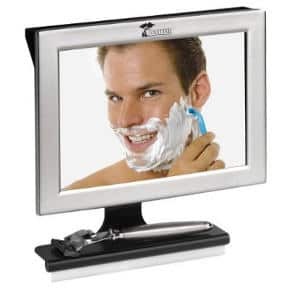 It has a great sturdy base and good image quality, making your shaving safe and easy and allowing users to make sure that they get those little stray hairs shaved. It also comes with a free separate razor holder and is 100% guaranteed. Very few users have felt that the suction doesn’t hold even the right type of shower walls, and that after some time, the finish that prevents the mirror from fogging up wears off. Still, the fogging may be due to cleaning the mirror with products that strip the fogging treatment from the mirror. 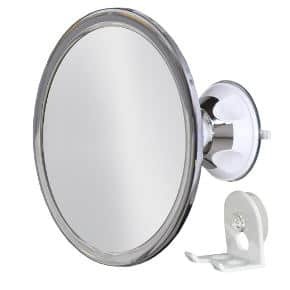 The ProBeauty Shower Mirror with integrated razor hook is a roundish shaped mirror measuring 5.75” X 6”. It has a hook for your razor built into the bottom of it and it attaches using a power lock suction cup. You don’t need to warm up the mirror or splash it with hot water to prevent it from fogging up. The mirror offers a 360 degree rotation for viewing your face at any angle. Users find that the suction cup works better than most, and that the mirror really doesn’t fog up unless cleaned with a harsh cleaner. They also like the overall look of the mirror and mention that it easy to install. The Handy ReflectXL Shower Mirror on rope is a versatile and easy way to use a mirror in your shower. You can hang this mirror on your shower wall or around your neck for easy use. It is made of acrylic, so it is both shadowless and shatterproof as well as fog free. It measures 7 5/8” X 5 5/8”. To activate its fogless properties, you simply heat up both the front and the back of this mirror with hot water when you first step into the shower and the majority of your mirror will stay fog free during your entire shower. While most users really liked this mirror on a rope, few found that the backing began to peel off the mirror after only a few months and they had some fogging up problems. 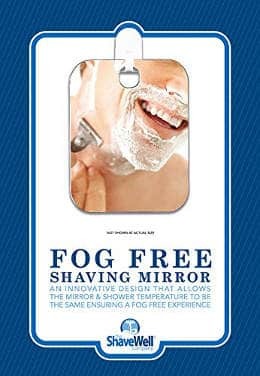 The Deluxe Shave Well Shower Mirror is a fog free mirror that measures 5.2” X 0.1” X 6.8” which is a third larger than the original deluxe shave well shower mirror. It uses adhesive hooks rather than suction cups to hold the mirror to your shower wall. The mirror itself is plastic rather than glass, which helps prevent breakage if it happens to fall. Some users say that the mirror isn’t really fog free as you need to keep splashing hot water on its surface, otherwise it fogs up. In addition, if you live in an area where you have hard water, the mirror will built up hard water spots that are difficult to remove without ruining its defogging. Several people have also mentioned that the adhesive hooks simply don’t hold, so they end up finding alternative solutions. 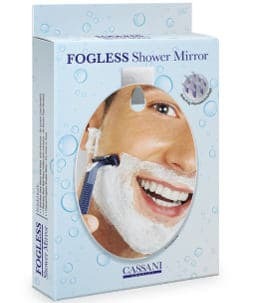 This Cassani Fogless Shatterproof Shower Mirror measures 6” X 7.5” and uses anti-fog nanotechnology to keep it from steaming up in the shower. The hooks are stainless steel and attach with an adhesive, which means once the mirror is placed, it won’t be easy to move. While users do find it easy to put up in their shower, the adhesive doesn’t always hold as it should. The mirror itself isn’t glass, so if it falls, it won’t break and it is lightweight. People also report that the anti-fog coating doesn’t last long, which may or may not be due to users cleaning the mirror, as it should only be cleaned with plain water and a clean soft cloth. However, it can be stained by spots caused by calcium in hard water so regular cleaning is advisable. 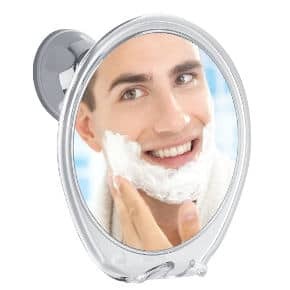 While there might not be an anti-fogging mirror which is going to be perfect for all users, these 6 shaving mirrors do offer people an easier way to shave in the shower, resulting in a closer and more convenient shave with less mess to clean up from their morning grooming.